Thanks to our generous sponsors of END of TRAIL, a literal pool of prizes are available for lucky draw to every participant of END of TRAIL! Every shooter has a chance to go home with the best prize of the match. 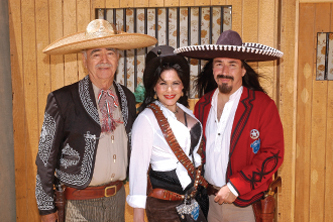 For over three decades, costuming has been a major factor in maintaining END of TRAIL's uniqueness as a shooting competition. Costuming creates both the environment and shared attitude that sets the tone for camaraderie unequaled in other shooting events. Because costuming is such an important aspect of our sport and is embraced with much effort and fervor by so many members, our costume winners have consistently shared honors with our shooters. Sunday is the day to suit up as your favorite character from the Wild Bunch film or in a military uniform of that era to be judged by a panel of roving judges while you are participating in the Wild Bunch Match. Categories are Male and Female and awards will be given from 1st – 3rd place. *NOTE: The costume being judged MUST be the costume in use on the range. The majority of the END of TRAIL costume contests judging will take place during the day on Daytime/Shooting costume categories are Male, Female, and Juniors. Daytime Costumes will be judged by a panel of judges. Regardless of which shooting relay you are on, you should have ample time to participate. You do not have to pre-register. Just show up at the designated times and sign in at the Gem Saloon. Awards are for 1st to 3rd place. 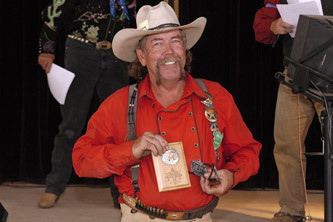 Conventioneers receive their own awards and are judged at the same times as the Daytime Costume Contests. No pre-registration is required. Just show up and sign in at the Gem Saloon. Categories are Male, Female, and Junior. Awards will be given 1st to 3rd. Waddies are those hard-working volunteers that have made END of TRAIL a success for over three decades, and they deserve their own costume awards! If you are a Waddie, you must take a breatk from your duties and come tot he GEM Saloon during judging times to participate. A first place Waddie Shooting Costume Award will be given to a Male and Female Waddie. Bring that fancy guncart to the GEM Saloon for Judging during designated judging times. Awards will be given for 1st-3rd place. Sutlers participate in END of TRAIL in order to sell their goods. So, our judges will be roaming Sutler's Row taking photos during the event. 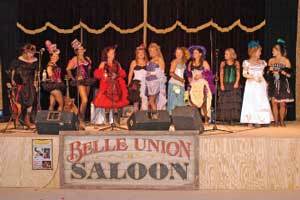 A first place award will be given to the Best Dressed Male and Female Sutler.